While I was there, I had the opportunity to meet quite a few of her neighbors. They’d stop in to meet “Bert’s daughter” and then we would chat for a bit. While chatting, I’d ask to hear their stories. Now they all had interesting stories about their children and grandchildren, where they worked when they were young, and places they had traveled. After they had shared these things, they would then begin to tell me stories from their childhood…. and these stories were not always pleasant. Many of them have stories of neglect. Others tell stories of abandonment. And still more had stories of child abuse and growing up with alcoholic parents. Even in their seventies, they hadn’t got over the pain they had experienced in their childhoods. Which is why I’m saying that sometimes we can’t just get over it….. sometimes we need help to work our way out of our pain. Often it’s as simple as having a friend who listen as we talk our through it. But for many of us, we may need more than the ear of a friend. We may need to be guided through the forgiveness process with the help of a pastor or counselor. We may need homework assignments such as keeping a gratitude journal or writing a forgiveness letter. We may need to be told that it wasn’t our fault and that we didn’t deserve what happened to us. I’m suggesting that those of us who are younger than our mid-seventies begin to find the inner healing that we need now. Because I noticed something else while I was there —- almost everyone who had a hard story to share with me also had some major health issues. This magnificent body that God created was never meant to carry so much pain for such a long journey. My prayer for today is that we be like Job…. in the second half of his life! My brother took me and my parents to Pike’s Place Market in downtown Seattle yesterday. As our day was ending and we were leaving the market, we came across a set of twins. One was shuffling down the walkway, gripping the rails with all of his strength, and being guided by his younger brother. His brother told me that they were 86 years old and that the shuffling man was six minutes older than he was…. He then asked how in the world a six minute age gap could make his brother an old man while he was still fit and spry. While I don’t know the details about their lives, I would venture to say that the younger one stayed active and, for whatever the reason, the older brother did not. I say this because I’m staying with my parents in their senior housing neighborhood and I see how these choices have played out all around me. There are men and women who are out sweeping their sidewalks, walking their dogs, taking water aerobics, and working in their yards. On my flight over here, I met an 80 year old ballroom dancer who is still competing. My best friend’s 84 year old mom does the polka in her kitchen every night. And at the gym there is a 75 year old retired nurse who has hired a trainer to help her with body building. I don’t know about you, but as for me, I am pretty determined to be in the fit category. Why? Because I want to be like these heroes of mine and enjoy every minute of this life that God has given me. While there are many reasons to stay fit, I think that one of the best reasons is that I can play with LIberty. In her little mind, I am her personal play servant. Almost every day we would walk to the park and play on the slides. I am proud to say that I can keep up with this energizer bunny. 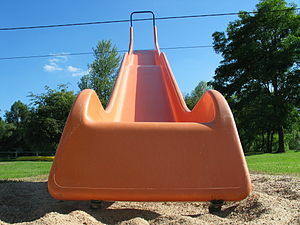 Not only could I climb on the equipment, my rear-end fit on the slide! When I’m with this little girl, I don’t have a care in the world. She accepts me as I am and wants nothing more than to be with me. We play all day long. On one of our walks, she heard a neighbor’s wind chimes so we stood on the sidewalk and danced to the music. We play pretend with her little people and I make all the animal noises on the farm. We wrestle. We sing and dance. And we cuddle and read books. Another benefit to being fit is that I was able to carry this precious sleeping child through the Columbus Zoo and out to the car. Almost 30 pounds of love with her arms wrapped around my neck and her head nestled close to my face wasn’t heavy – it was heavenly! Our health and vitality isn’t for us alone. It’s about much more than how we look in a bathing suit or how we feel about ourselves when we are in a crowd of people. It’s more than the peace of mind that comes in knowing that we are preventing diseases such as diabetes and high blood pressure. It’s a gift we give to our children and our children’s children.